Responsible editor: Myra Spiliopoulou,Bamshad Mobasher, Olfa Nasraoui, Osmar Zaiane. Alm CO, Roth D, Sproat R (2005) Emotions from text: machine learning for text-based emotion prediction. In: Proceedings of the conference on human language technology and empirical methods in natural language processing, Association for Computational Linguistics, Morristown, NJ, USA, HLT’05, pp 579–586. 10.3115/1220575.1220648. Archak N, Ghose A, Ipeirotis PG (2007) Show me the money! : deriving the pricing power of product features by mining consumer reviews. 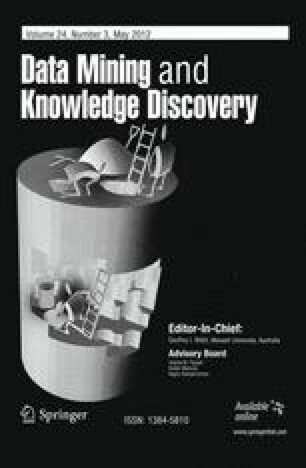 In: Proceedings of the 13th ACM SIGKDD international conference on knowledge discovery and data mining, ACM, New York, NY, USA, KDD’07, pp 56–65. doi: 10.1145/1281192.1281202. Bodendorf F, Kaiser C (2009) Detecting opinion leaders and trends in online social networks. In: Proceeding of the 2nd ACM workshop on social web search and mining. ACM, New York, NY, USA, SWSM’09, pp 65–68, doi: 10.1145/1651437.1651448. Carenini G, Ng RT, Zwart E (2005) Extracting knowledge from evaluative text. In: Proceedings of the 3rd international conference on Knowledge capture. ACM, New York, NY, USA, K-CAP’05, pp 11–18. doi: 10.1145/1088622.1088626. Chaovalit P, Zhou L (2005) Movie review mining: a comparison between supervised and unsupervised classification approaches. Hawaii international conference on system sciences, vol 4, p 112c. doi: 10.1109/HICSS.2005.445. Chen F, Tan PN, Jain AK (2009) A co-classification framework for detecting web spam and spammers in social media web sites. In: Proceeding of the 18th ACM conference on information and knowledge management. ACM, New York, NY, USA, CIKM’09, pp 1807–1810. doi: 10.1145/1645953.1646235. Choi Y, Kim Y, Myaeng SH (2009) Domain-specific sentiment analysis using contextual feature generation. In: Proceeding of the international CIKM workshop on topic-sentiment analysis for mass opinion measurement. ACM, New York, NY, USA, TSA’09, pp 37–44. doi: 10.1145/1651461.1651469. Church KW, Hanks P (1989) Word association norms, mutual information, and lexicography. In: Proceedings of the 27th annual meeting on Association for Computational Linguistics, Association for Computational Linguistics, Morristown, NJ, USA, pp 76–83. doi: 10.3115/981623.981633. Dave K, Lawrence S, Pennock D (2003) Mining the peanut gallery: opinion extraction and semantic classification of product reviews. In: Proceedings of the 12th international conference on World Wide Web, ACM, New York, NY, USA, WWW’03, pp 519–528. doi: 10.1145/775152.775226. Feng S, Wang D, Yu G, Yang C, Yang N (2009) Sentiment clustering: a novel method to explore in the blogosphere. In: Proceedings of the joint international conferences on advances in data and web management. Springer-Verlag, Berlin, Heidelberg, APWeb/WAIM’09, pp 332–344. doi: 10.1007/978-3-642-00672-2_30. Galley M, McKeown K, Hirschberg J, Shriberg E (2004) Identifying agreement and disagreement in conversational speech: Use of Bayesian networks to model pragmatic dependencies. In: Proceedings of the 42nd annual meeting on Association for Computational Linguistics, Association for Computational Linguistics, Morristown, NJ, USA, ACL’04, pp 669–676. doi: 10.3115/1218955.1219040. Gamon M (2004) Sentiment classification on customer feedback data: noisy data, large feature vectors, and the role of linguistic analysis. In: Proceedings of the 20th international conference on computational linguistics, Association for Computational Linguistics, Morristown, NJ, USA, COLING’04, p 841. doi: 10.3115/1220355.1220476. Hu M, Liu B (2004a) Mining and summarizing customer reviews. In: Proceedings of the 10th ACM SIGKDD international conference on knowledge discovery and data mining. ACM, New York, NY, USA, KDD’04, pp 168–177. doi: 10.1145/1014052.1014073. Jindal N, Liu B (2008) Opinion spam and analysis. In: Proceedings of the international conference on Web search and web data mining. ACM, New York, NY, USA, WSDM’08, pp 219–230. doi: 10.1145/1341531.1341560. Kim SM, Hovy E (2004) Determining the sentiment of opinions. In: Proceedings of the 20th international conference on computational linguistics, Association for Computational Linguistics, Morristown, NJ, USA, COLING’04, p 1367. doi: 10.3115/1220355.1220555. Kim HD, Zhai C (2009) Generating comparative summaries of contradictory opinions in text. In: Proceedings of the 18th ACM conference on information and knowledge management. ACM, New York, NY, USA, CIKM’09, pp 385–394. doi: 10.1145/1645953.1646004. Ku LW, Lee LY, Wu TH, Chen HH (2005) Major topic detection and its application to opinion summarization. In: Proceedings of the 28th annual international ACM SIGIR conference on research and development in information retrieval. ACM, New York, NY, USA, SIGIR’05, pp 627–628. doi: 10.1145/1076034.1076161. Lin C, He Y (2009) Joint sentiment/topic model for sentiment analysis. In: Proceeding of the 18th ACM conference on information and knowledge management. ACM, New York, NY, USA, CIKM’09, pp 375–384. doi: 10.1145/1645953.1646003. Liu B, Hu M, Cheng J (2005) Opinion observer: analyzing and comparing opinions on the web. In: Proceedings of the 14th international conference on world wide web. ACM, New York, NY, USA, WWW’05, pp 342–351. doi: 10.1145/1060745.1060797. Lu Y, Tsaparas P, Ntoulas A, Polanyi L (2010) Exploiting social context for review quality prediction. In: Proceedings of the 19th international conference on world wide web. ACM, New York, NY, USA, WWW’10, pp 691–700. doi: 10.1145/1772690.1772761. Melville P, Gryc W, Lawrence RD (2009) Sentiment analysis of blogs by combining lexical knowledge with text classification. In: Proceedings of the 15th ACM SIGKDD international conference on knowledge discovery and data mining. ACM, New York, NY, USA, KDD’09, pp 1275–1284. 10.1145/1557019.1557156. Missen MM, Boughanem M (2009) Using wordnet’s semantic relations for opinion detection in blogs. In: Proceedings of the 31th European conference on IR research on advances in information retrieval. Springer-Verlag, Berlin, ECIR’09, pp 729–733. doi: 10.1007/978-3-642-00958-7_75. Morinaga S, Yamanishi K, Tateishi K, Fukushima T (2002) Mining product reputations on the web. In: Proceedings of the eighth ACM SIGKDD international conference on Knowledge discovery and data mining. ACM, New York, NY, USA, KDD’02, pp 341–349. doi: 10.1145/775047.775098. Nowson S (2009) Scary films good, scary flights bad: topic driven feature selection for classification of sentiment. In: Proceeding of the international CIKM workshop on topic-sentiment analysis for mass opinion measurement. ACM, New York, NY, USA, TSA’09, pp 17–24. doi: 10.1145/1651461.1651465. Osherenko A, André E (2007) Lexical affect sensing: Are affect dictionaries necessary to analyze affect? In: Proceedings of the 2nd international conference on affective computing and intelligent interaction. Springer-Verlag, Berlin, ACII’07, pp 230–241. doi: 10.1007/978-3-540-74889-2_21. Read J, Carroll J (2009) Weakly supervised techniques for domain-independent sentiment classification. In: Proceeding of the international CIKM workshop on topic-sentiment analysis for mass opinion measurement. ACM, New York, NY, USA, TSA’09, pp 45–52. doi: 10.1145/1651461.1651470. Turney PD (2002) Thumbs up or thumbs down? : semantic orientation applied to unsupervised classification of reviews. In: Proceedings of the 40th annual meeting on ACL, Association for Computational Linguistics, Morristown, NJ, USA, ACL’02, pp 417–424. doi: 10.3115/1073083.1073153. Zhu J, Zhu M, Wang H, Tsou BK (2009) Aspect-based sentence segmentation for sentiment summarization. In: Proceeding of the international CIKM workshop on topic-sentiment analysis for mass opinion measurement. ACM, New York, NY, USA, TSA’09, pp 65–72. doi: 10.1145/1651461.1651474.